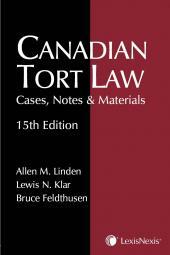 When Canadian Tort Law was first published in 1972, it became the first treatise on the law of torts in Canada. The eleventh edition continues the standard of excellence achieved by each previous edition. 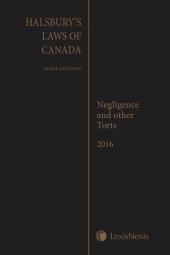 As the treatise most commonly cited by the Supreme Court of Canada and other Canadian courts, Canadian Tort Law has greatly influenced the development of tort law in Canada. Chapter 3 – new case law discussion of consent with regards to “intentional” torts, including new analysis on consent in the medical context and defense of public necessity. Chapter 6 – new analysis on the Modified Duty of Care Framework stemming from Cooper vs. Hobart and Edwards vs. Law Society of Upper Canada; Duty to Confer Benefits: Nonfeasance and Misfeasance; Duty to Rescue; and Alcohol-Related Affirmative Duties. Chapter 7 – new analysis of remoteness of damage and foreseeability, including discussion of new Supreme Court of Canada cases dealing with remoteness and foreseeability such as Rankin (c.o.b. Rankin’s Garage & Sales) v. JJ, as well as new discussion of “thin skull” cases and cases involving intervening acts (such intentional and criminal conduct). Chapter 8 – Substantially revised chapter on negligent infliction of mental injury taking into account recent Supreme Court of Canada decisions Mustapha v. Culligan of Canada Ltd and the 2017 decision Saadati v. Moorhead which have profoundly shaped tort law’s response to mental injury. Chapter 9 – discussion of the influential 2017 Supreme Court of Canada decision Deloitte & Touche v. Livent Inc. (Receiver of) on its impact with respect to the negligent infliction of pure economic loss, including indicia which can be used as a guide for the recognition of a duty of care, and other new cases on reasonable reliance. Chapter 10 – Defences to Negligence: The Conduct of the Plaintiff includes new discussion concerning voluntary assumption of risk, including the narrowing of the definition of volenti and new case law on illegal conduct on the part of the plaintiff. Chapter 11 – A new analysis of strict liability including the scope of Rylands v. Fletcher. Chapter 12 – New examination of how aspects of both public and private nuisance, and the principle from Rylands and Fletcher, have been clarified through decisions in a number of appellate court cases such as Smith v. Inco Limited, Saik'uz First Nation and Stellat'en First Nation v. Rio Tinto Alcan Inc, and George v. Newfoundland and Labrador. Chapter 13 – updated analysis of defences to product liability and the special category of “inherently dangerous things and abnormal use”. Chapter 14 – new discussion on government negligence liability and Charter damage claims. Chapter 15 – discussion of new cases on the scope of occupier’s liability including public property adjacent to occupier property and waiver of liability cases. Chapter 16 – substantially re-written chapter on defamation, including new discussion on libel vs. slander, fair comment, remedies, and new developments with anti-SLAPP cases, privacy torts and cyberbullying legislation. Bruce Feldthusen, B.A., LL.B., LL.M., S.J.D., is a Professor of Law at the University of Ottawa and a member of the Bar of Ontario. He was a Professor of Law at the University of Western Ontario from 1977 to 1999 and served as Dean of the Common Law Section of the University of Ottawa from January 2000 to June 2013. He is a member of the American Law Institute and a past president of the Canadian Law Deans. Professor Feldthusen serves as Canada's representative to the World Tort Society. He has taught law in Canada, the United States and Australia and was the Research Director for the Ontario Law Reform Commission's 1989 study on Exemplary Damages, which has been cited with approval and adopted in many common law jurisdictions in Canada and abroad. Professor Feldthusen is well known and internationally recognized for his treatise Economic Negligence, now in its sixth edition, which has been relied on by the Supreme Court of Canada and which now provides the organizing framework for all negligence actions in that field. He is co-authors with the late Honourable Allen M. Linden and Professor Lewis Klar of the popular casebook Canadian Tort Law (LexisNexis Canada). Feldthusen’s analysis of pure economic loss has been adopted by the Supreme Court of Canada and now provides the organizing framework for all negligence actions in that field. He was one of the first legal academics to study civil remedies for victims of sexual assault. Feldthusen was the research director for the Ontario Law Reform Commission’s 1989 study on Exemplary Damages, which has been cited with approval and adopted in many common law jurisdictions in Canada and abroad. His recent work has concentrated on the law of negligence as applied to government and statutory public authorities. He has also practised law and works frequently as a litigation consultant on issues in tort law. He is co-author with the late Honorable Allen M. Linden of the Torts and Negligence volumes of Halsbury's Laws of Canada, and co-author with Margaret Isabel Hall, Erik S. Knutsen and Hilary Young of Canadian Tort Law, 11th Edition and Canadian Tort Law, 11th Edition - Student Edition. The late Honourable Allen M. Linden, O.C., Q.C., B.A., LL.B., LL.M., J.S.D., was a Judge of the Federal Court of Appeal from 1990 to 2009. Previously, he was a Professor of tort law at Osgoode Hall Law School of York University in Toronto from 1961 to 1978, and acted as Founding Executive Director of the Canadian Institute on the Administration of Justice from 1974 to 1978. He was appointed as a Trial Judge on the Superior Court of Ontario from 1978 to 1990, and served as President of the Law Reform Commission of Canada from 1983 to 1990. Mr. Linden was a member of the American Law Institute. He taught law in the United States, Australia and the United Kingdom, and taught part-time at the University of Ottawa and at Pepperdine University, School of Law in California. In 1965, he authored a statistical study on Compensation for Auto Accidents, which led the Province of Ontario to adopt a no-fault auto insurance plan in 1969, which influenced other provinces to follow. He has written several books and many articles about torts, which led to the award of the Professor John G. Fleming Award for Outstanding Scholarship in Tort Law. In 2011, he received the David Walter Mundell Medal for his distinguished contribution to law and letters. On July 1, 2015, Justice Linden was inducted to membership in the Order of Canada by Governor General David Johnston. He is co-author, with Bruce Feldthusen, of the Torts and Negligence volumes of Halsbury's Laws of Canada and of Canadian Tort Law, 11th Edition and Canadian Tort Law, 11th Edition - Student Edition. He is also co-author, with Stephen E. Firestone, of Butterworths Ontario Motor Vehicle Insurance Practice Manual. 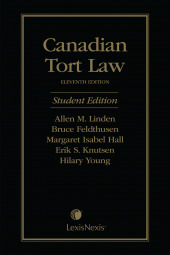 Mr. Linden passed away after completion of Canadian Tort Law - Cases, Notes & Materials, 15th Edition but before publication. Margaret Isabel Hall, B.A. (Hons), LL.B., LL.M.,Ph.D., is an Associate Professor in the Faculty of Law at Thompson Rivers University, British Columbia, Canada where she teaches Torts, Advanced Torts, and Wills and Estates. Prior to joining Thompson Rivers as a founding faculty member, Prof. Hall taught torts at the University of British Columbia Faculty of Law, and the University of Ottawa Faculty of Law (Common Law), Prof. Hall has also worked in law reform (for the British Columbia Law Institute), and is the author of numerous law reform publications. Prof. Hall is the co-author of the Law of Nuisance in Canada, published by LexisNexis in 2010 (first edition) and 2015 (second edition). In 2018. a volume edited by Prof. Hall titled The Canadian Law of Obligations: Private Law for the 21st Century was published by LexisNexis and was also published in that same year as a special volume of the Supreme Court Law Reports. Prof. Hall has published extensively in the area of tort law, with a focus on nuisance, the principle from Rylands v. Fletcher, theories of systemic liability in tort law, vicarious liability, and public authority liability. Prof. Hall’s work has been cited by Canadian appellate and trial courts and in law reform reports in Canada and Australia. In addition to tort law, Prof. Hall has also published extensively on issues relating to mental capacity in the law. Prof. Hall is a Visiting Professor in the School of Criminology at Simon Fraser University, British Columbia, and was a Visiting Scholar at the Macquarie University Faculty of Law in Sydney, Australia in 2018. Erik S. Knutsen, B.A. (Hons), J.D., LL.M. is a Professor and Associate Dean (Academic) at the Faculty of Law, Queen’s University. He has also taught in the Queen’s School of Medicine and as a core faculty member in Queens’ interdisciplinary Masters of Science in Healthcare Quality program. Professor Knutsen’s areas of academic interest include tort, insurance, and the civil litigation system. He is a co-author of Stempel & Knutsen on Insurance Coverage, an American insurance law treatise. He is also co-author of a casebook on Canadian civil litigation and one on American insurance law. His work has been cited by Canadian, American and European appellate and trial courts. Professor Knutsen earned his Masters of Law (LL.M.) from Harvard Law School, his Juris Doctor (J.D.) from Osgoode Hall Law School, and his Honours Bachelor of Arts (B.A.(Hons.)) from Lakehead University. Professor Knutsen is a recipient of the Queen’s University-wide Chancellor A. Charles Baillie Teaching Award and has three times earned the faculty teaching award at Queen’s Faculty of Law. He was previously a Visiting Assistant Professor at Florida State University College of Law, where he also earned a teaching award. He has practiced tort and insurance litigation in Thunder Bay at Carrel + Partners LLP, in Toronto at Fasken Martineau LLP, and in New York at Paul, Weiss LLP where he assisted with 9/11 World Trade Center cases. Professor Knutsen regularly consults with lawyers on cases heading to trial or appeal. Hilary A. N. Young, B.A., M.A., Ph.D., LL.B., LL.M., is an Associate Professor in the University of New Brunswick's Faculty of Law. She obtained her Ph.D. in linguistics from Rice University, an LL.B. from the University of Ottawa Faculty of Common Law and an LL.M. from Harvard Law School. She clerked for Justice Louis LeBel at the Supreme Court of Canada and practiced civil litigation at Cox & Palmer in Halifax before beginning her academic career. Dr. Young’s research and teaching interests include defamation, privacy, tort and health law. She is one of Canada's leading defamation scholars: She has conducted a major empirical study of Canadian defamation law and has published on anti-SLAPP laws, defamatory meaning, corporate and government defamation actions, internet intermediary liability (with Emily Laidlaw) and the responsible communication defence. She is a member of the Advisory Group for the Law Commission of Ontario's Defamation Law in the Internet Age project. She is also an expert advisor on the Uniform Law Conference of Canada's project on torts for the unauthorized distribution of intimate images. Dr. Young also researches and teaches health law, with an emphasis on informed consent and end of life legal issues. Her work has been cited by courts, including the Supreme Court of Canada, and has been funded by granting agencies including the Social Sciences and Humanities Research Council of Canada.